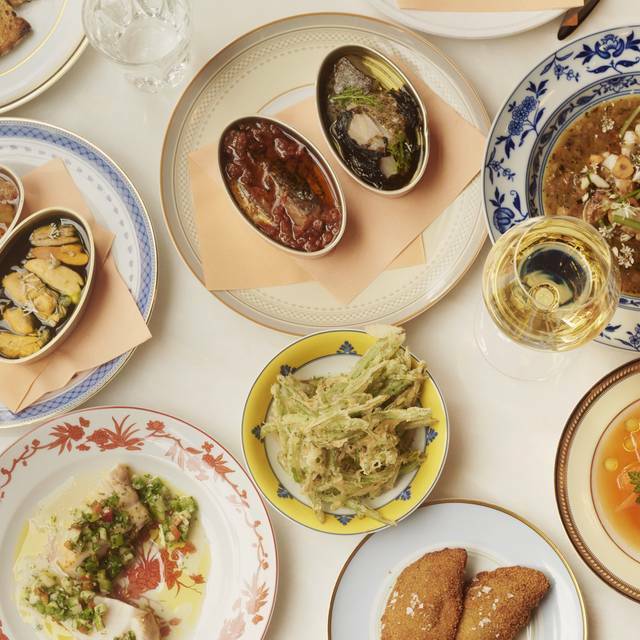 Taberna do Mercado is an all-day casual Portuguese restaurant from chef Nuno Mendes, offering small sharing plates alongside an exiting and accessible Portuguese wine list. Taberna do Mercado is open from 12 noon all day every day. Between 3pm—6pm you can walk in for drinks, cured meats, cheeses and other cold snacks. *Except Sundays when we offer a dinner service between 6pm and 8pm. Situated a short walk from Liverpool Street and Aldgate East underground stations and Shoreditch High Street overground station. Outstandingly creative Portuguese cooking. Interesting wines. A very informal atmosphere and friendly staff. 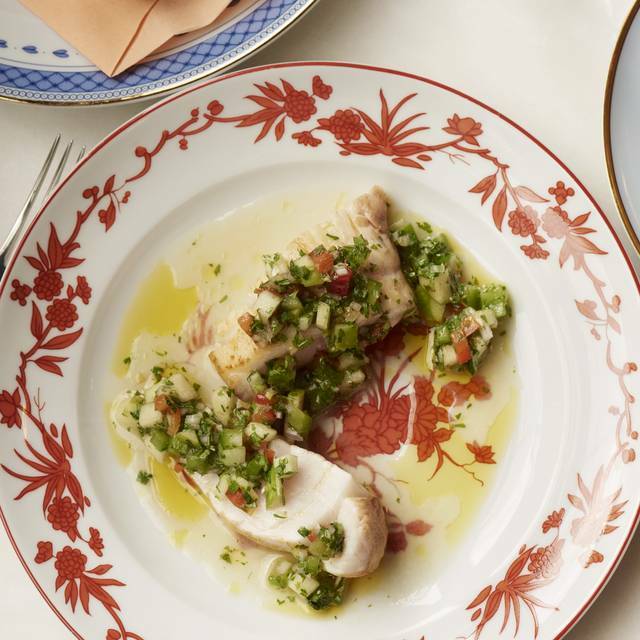 Fantastic restaurant with a really creative menu and interesting take on Portuguese cuisine. Had read reviews commenting on the staff but found everyone there to be an absolute pleasure, offering plenty of great advice and a friendly service. The food is fantastic with a good portion size for sharing and puddings worth saving room for! Would highly recommend. Excellent food. My favorite : mackerel filet with home made dried tomatos and a home made fish broth.. Really excellent. Delicious food, excellent service. Small plates are perfect for sharing. And make sure you have the pastel de nata for dessert! Excellent petiscos and wine to celebrate my husband's birthday. Nice atmosphere. Particularly liked the ham (palheta) and bean fritters. A good variety of Wine by the glass was available. Tasty custard tart straight from the oven! Very easy going place, still with a touch of Mediterranean style. Healthy and taste food, and good wine. We have been sitting outside so it was intimate and not noisy. Very good Portugese tapas. Creative and surprising. Beautiful desserts: pastel de nata best wellknown Portugese dessert but here very good executed - crunchy outside and light - not to sweet creamy custard. Pao de Lo: surprising sponge cake with liquid centre and touch of seasalt (flaky crystals)... and most memorable: Abade de Priscos: culinary art. Beautiful to look at and delicious. How this dessert is made with porc fat is a mystery. As a foodie I would like to know! Guest wife and other staff gives you excellent service! The food at the Taberna is outstanding - lots of little well made imaginative dishes and delicious desserts. It's pricey but worth it. Unfortunately this time the service was less than expected - which given the service is included in the bill is disappointing. Hopefully will improve for next visit. Suuuuuuper good. The waiters are quite patient and friendly. Good food! Delicious food that's well-priced and a great range of Portuguese wines (also try the excellent gin). Highly recommend the pork sandwich, the green bean fritters and the pork and chicken sausage. The pao de lò cake was fantastic, truly recommend this restaurant, excellent value, great fresh food, perfectly executed and presented. Lovely venue, great staff, great beer. Just a shame the portions are sooooo small. For two us we had 8 tapas and still left hungry. The beer is Super Bock on draft which is great. Had an amazing meal at Taberna - I'd been wanting to go for a while, and so booked in for my boyfriends 30th. As a surprise, his mum was joining us (from Australia!) and the staff were EXCELLENT at keeping this a surprise, and making the evening completely seamless. The staff were very knowledgeable about the food, and with 6 of us dining, were able to just put together a really delicious selection so we didn't have to think too much about it! Tasty sharing food, with excellent wine and amazing service! Highly recommended. Why does this review have to be 50 characters for me to submit it? I went there last Sunday to meet with a friend in town and what a lovely surprise! The food was delicious,the staff really friendly and with a lot of good tips,the atmosphere was lovely. It's definitely a must to go if you're around the area - and make sure you try the pão de ló! Very bad experience. Average and greasy food. Overpriced! Tapas are super small but expensive. On top of that also the service was a bit rude and unprofessional. They recommended a bottle of wine and it was 44 pounds. Definitely not worth it! Amazing as always, it's always a pleasure to go back and have such an amazing food and service. Will come back soon. Met up with some friends for a meal after a visit to Dennis Sever's House. We had a fab evening. The service was really good, the staff were knowledgable and helpful. We were not sure what to order as this was Portuguese tapas as apposed to the Spanish tapas we were used to ordering. The advice they gave us was good as the food that arrived was delicious. The wine was a special treat - from Portugal. Not had before and really enjoyed it. We all agreed we would visit again despite it being a bit pricey (around £55 per head). There was live music in the market which was a bit loud, but did not spoil the evening. Have eaten here several years since opened and always LOVED it. Yesterday wasn't good though (sorry) - very poor experience all round and think maybe few guys on first shifts and so on - or just not getting it - felt very stilted and awkward. Will still return as love the menu. The food and service was good but it's totally overpriced, so disappointing overall. Nearby Smokestak is much better. Excellent food with friendly service. I don't know much about Portuguese wines, but the staff were very helpful and we had a lovely bottle of red wine. We were very adventurous and we tried a lot of dishes that we didn't really know what they were and they were all delicious! The food is delicious and the service really good! I recommend it for a special occasion! Innovative modern Portuguese beautifully presented, using well sourced quality ingredients treated with respect by the kitchen team. Slight quibble over some of the portion sizes. The 200 day aged beef is a must ! Small but well put together wine list and the red's from the Azores ouze with character, feral and alive ! Wiill definitely go again ! The Restaurant provides a very good selection of Portuguese tapas with a personal touch from the Chef! The quality of the food is very good, however some of the portions are ridiculous small for the price! If you are hungry be prepared to pay. Overall Good but extremely overpriced! The place in itself it's not bad. However, it's not mind blowing. And the fact that's on Spitafield it's a bit off putting. The food it's really nice, not heavy yet not memorable. The best is the Prego sandwich followed by the shrimp dish. The service is very nice and friendly. Overall it's OK. The bitter end it's the bill. Although it's the norm to pay £35 pounds for a dinner in London, in this case it felt not commesurate with the whole dinner experience. Great food, great service and a good location. We really enjoyed our long lazy lunch. Very well reinvented comfort Portuguese food. Friendly service. Poor wine selection. Very good value. Simple but elegant, serving amazing Portuguese tapas! Incredible food, brilliant service. What more needs to be said, apart from we kept requesting more bread to mop up the saucy remains of each dish. Worth every penny. 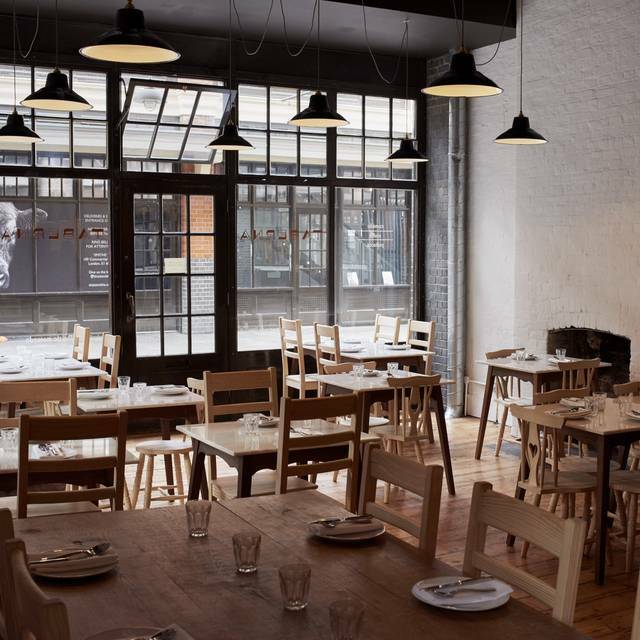 Had an outstanding dinner here while visiting London; creative, modern Portuguese food, served in small plate format. The fish and charcuterie were some of the best we've ever had. Interesting wine list and friendly, low-key service. We liked it so much we went back for lunch a few days later. A real find. Great food with fantastic service. The staff really went the extra mile to give us a great experience. The food here is amazing Portuguese cooking, all so flavourful and delicious. It's worth asking for recommendations from your waiter as they're really knowledgeable and won't steer you wrong. The service is brilliant and the ambience great for a casual catch up. It's a relaxed setting with sublime food, I highly recommend it.